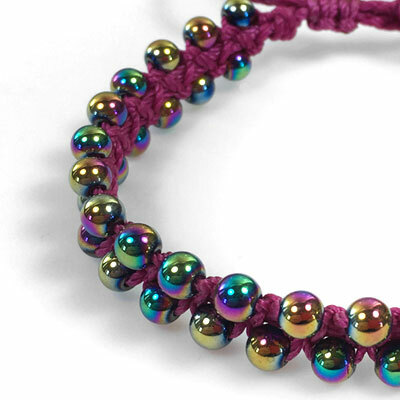 Rainbow titanium hematite beads are interspersed at regular intervals along the edge of a knotted nylon center band. The center band is knotted with nylon in a magenta color reminiscent of Mardi Gras colors. The ends are braided. The rainbow titanium coated hematite beads are man-made beads finished with a permanent multi colored titanium finish.